This event vacated terrestrial ecological niches, allowing the dinosaurs to assume the dominant roles in the Jurassic period. This event happened in less than 10,000 years and occurred just before Pangaea started to break apart. In the area of Tübingen (Germany), a Triassic-Jurassic bonebed can be found, which is characteristic for this boundary. The extinction event marks a floral turnover as well. About 60% of the diverse monosaccate and bisaccate pollen assemblages disappear at the T-J boundary, indicating a major extinction of plant genera. Early Jurassic pollen assemblages are dominated by Corollina, a new genus that took advantage of the empty niches left by the extinction. Statistical analysis of marine losses at this time suggests that the decrease in diversity was caused more by a decrease in speciation than by an increase in extinctions. Fish did not suffer a mass extinction at the end of the Triassic. 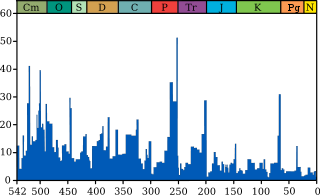 The late Triassic in general did experience a gradual drop in actinopterygiian diversity after an evolutionary explosion in the middle Triassic. Though this may have been due to falling sea levels or the Carnian pluvial event, it may instead be a result of sampling bias considering that middle Triassic fish have been more extensively studied than late Triassic fish. Despite the apparent drop in diversity, neopterygiians (which include most modern bony fish) suffered less than more "primitive" actinopterygiians, indicating a biological turnover where modern groups of fish started to supplant earlier groups. Like fish, marine reptiles experienced a substantial drop in diversity between the middle Triassic and the Jurassic. However, their extinction rate at the Triassic-Jurassic boundary was not elevated. The highest extinction rates experienced by Mesozoic marine reptiles actually occurred at the end of the Ladinian stage, which corresponds to the end of the middle Triassic. The only marine reptile families which went extinct at or slightly before the Triassic-Jurassic boundary were the placochelyids (the last family of placodonts), and giant ichthyosaurs such as shastasaurids and shonisaurids. Nevertheless, some authors have argued that the end of the Triassic acted as a genetic "bottleneck" for ichthyosaurs, which never regained the level of anatomical diversity and disparity which they possessed during the Triassic. One of the earliest pieces of evidence for a late Triassic extinction was a major turnover in terrestrial tetrapods such as amphibians, reptiles, and synapsids. Edwin H. Colbert drew parallels between the system of extinction and adaptation between the Triassic-Jurassic and Cretaceous-Paleogene boundaries. He recognized how dinosaurs, lepidosaurs (lizards and their relatives), and crocodyliforms (crocodilians and their relatives) filled the niches of more ancient groups of amphibians and reptiles which were extinct by the start of the Jurassic. Olson (1987) estimated that 42% of all terrestrial tetrapods went extinct at the end of the Triassic, based on his studies of faunal changes in the Newark Supergroup of eastern North America. More modern studies have debated whether the turnover in Triassic tetrapods was abrupt at the end of the Triassic, or instead more gradual. During the Triassic, amphibians were mainly represented by large, crocodile-like members of the order Temnospondyli. Although the earliest lissamphibians (modern amphibians like frogs and salamanders) did appear during the Triassic, they would become more common in the Jurassic while the temnospondyls diminished in diversity past the Triassic-Jurassic boundary. Although the decline of temnospondyls did send shockwaves through freshwater ecosystems, it was probably not as abrupt as some authors have suggested. Brachyopoids, for example, survived until the Cretaceous according to new discoveries in the 1990s. Several temnospondyl groups did go extinct near the end of the Triassic despite earlier abundance, but it is uncertain how close their extinctions were to the end of the Triassic. The last known metoposaurids ("Apachesaurus") were from the Redonda Formation, which may have been early Rhaetian or late Norian. Gerrothorax, the last known plagiosaurid, has been found in rocks which are probably (but not certainly) Rhaetian, while a capitosaur humerus was found in Rhaetian-age deposits in 2018. Therefore, plagiosaurids and capitosaurs were likely victims of an extinction at the very end of the Triassic, while most other temnospondyls were already extinct. Terrestrial reptile faunas were dominated by archosauromorphs during the Triassic, particularly phytosaurs and members of Pseudosuchia (the reptile lineage which leads to modern crocodilians). In the early Jurassic and onwards, dinosaurs and pterosaurs became the most common land reptiles, while small reptiles were mostly represented by lepidosauromorphs (like lizards and tuatara relatives) and pseudosuchians experienced massive extinctions leaving only crocodylomorphs surviving into the Jurassic. Gradual climate change, sea-level fluctuations, or a pulse of oceanic acidification during the late Triassic may have reached a tipping point. However, this does not explain the suddenness of the extinctions in the marine realm. The Manicouagan reservoir in Quebec, a massive crater formed by a Late Triassic impact. Radiometric dating has determined that it is about 13 million years older than the Triassic-Jurassic boundary, and thus an unlikely candidate for a mass extinction. Some have theorized that an impact from an asteroid or comet may have caused the Triassic-Jurassic extinction, similar to the extraterrestrial object which was the main factor in the Cretaceous-Paleogene extinction about 66 million years ago, as evidenced by the Chicxulub crater in Mexico. However, so far no impact crater of sufficient size has been dated to precisely coincide with the Triassic–Jurassic boundary. Nevertheless, the late Triassic did experience several impacts, including the second-largest confirmed impact in the Mesozoic. The Manicouagan Reservoir in Quebec is one of the most visible large impact craters on Earth, and at 100 km in diameter it is tied with the Eocene Popigai crater in Siberia as the fourth-largest impact crater on Earth. Olsen et al. (1987) were the first scientists to link the Manicouagan crater to the Triassic-Jurassic extinction, citing its age which at the time was roughly considered to be late Triassic. More precise radiometric dating by Hodych & Dunning (1992) has shown that the Manicouagan impact occurred about 214 million years ago, about 13 million years before the Triassic-Jurassic boundary. Therefore, it could not have been responsible for an extinction precisely at the Triassic-Jurassic boundary. Nevertheless, the Manicougan impact did have a widespread effect on the planet; a 214-million-year-old ejecta blanket of shocked quartz has been found in rock layers as far away as England and Japan. There is still a possibility that the Manicouagan impact was responsible for a small extinction midway through the late Triassic at the Carnian-Norian boundary, although the disputed age of this boundary (and whether an extinction actually occurred in the first place) makes it difficult to correlate the impact with extinction. Onoue et al. (2016) alternatively proposed that the Manicouagan impact was responsible for a marine extinction in the middle of the Norian which impacted radiolarians, sponges, conodonts, and Triassic ammonoids. Thus, the Manicouagan impact may have been partially responsible for the gradual decline in the latter two groups which culminated in their extinction at the Triassic-Jurassic boundary. Other Triassic craters are closer to the Triassic-Jurassic boundary but also much smaller than the Manicouagan reservoir. The eroded Rochechouart crater in France has most recently been dated to 201 ±2 million years ago, but at 25 km (16 mi) across (possibly up to 50 km (30 mi) across originally), it appears to be too small to have affected the ecosystem. Other putative or confirmed Triassic craters include the 80 km wide Puchezh-Katunki crater in Eastern Russia (though it may be Jurassic in age), the 40 km wide Saint Martin crater in Manitoba, the 15 km wide Obolon' crater in Ukraine, and the 9 km wide Red Wing Creek structure in North Dakota. Spray et al. (1998) noted an interesting phenomenon, that being how the Manicoagan, Rochechoart, and Saint Martin craters all seem to be at the same latitude, and that the Obolon' and Red Wing craters form parallel arcs with the Rochechoart and Saint Martin craters, respectively. Spray and his colleagues hypothesized that the Triassic experienced a "multiple impact event", a large fragmented asteroid or comet which broke up and impacted the earth in several places at the same time. Such an impact has been observed in the present day, when Comet Shoemaker-Levy 9 broke up and hit Jupiter in 1992. However, the "multiple impact event" hypothesis for Triassic impact craters has not been well-supported; Kent (1998) noted that the Manicouagan and Rochechoart craters were formed in eras of different magnetic polarity, and radiometric dating of the individual craters has shown that the impacts occurred millions of years apart. Massive volcanic eruptions, specifically the flood basalts of the Central Atlantic Magmatic Province (CAMP), would release carbon dioxide or sulfur dioxide and aerosols, which would cause either intense global warming (from the former) or cooling (from the latter). The record of CAMP degassing shows several distinct pulses of carbon dioxide immediately following each major pulse of magmatism, at least two of which amount to a doubling of atmospheric CO2. 2 greenhouse and a marine biocalcification crisis. Contemporaneous CAMP eruptions, mass extinction, and the carbon isotopic excursions are shown in the same places, making the case for a volcanic cause of a mass extinction. The catastrophic dissociation of gas hydrates (suggested as one possible cause of the largest mass extinction of all time, the so-called "Great Dying" at the end of the Permian Period) may have exacerbated greenhouse conditions. Other scientists reject the volcanic eruption theory, because the Newark Supergroup, a section of rock that records the Triassic-Jurassic boundary, contains no ash-fall horizons and the first basalt flows lie ~10 meters above the transition zone. ^ Some sources (Whiteside et al 2010) give a date 181826.8 Ma. ^ Graham Ryder; David E. Fastovsky; Stefan Gartner (1996). The Cretaceous-Tertiary Event and Other Catastrophes in Earth History. Geological Society of America. p. 19. ISBN 9780813723075. ^ Sepkoski, J. John (1984). "A kinetic model of Phanerozoic taxonomic diversity. III. Post-Paleozoic families and mass extinctions". Paleobiology. 10 (2): 246–267. doi:10.1017/s0094837300008186. ISSN 0094-8373. ^ Johannes Baier: Der Geologische Lehrpfad am Kirnberg (Keuper; SW-Deutschland) Archived 2011-10-02 at the Wayback Machine. - Jber. Mitt. oberrhein. geol. Ver, N. F. 93, 9-26, 2011. ^ Bambach, R.K.; Knoll, A.H.; Wang, S.C. (December 2004). "Origination, extinction, and mass depletions of marine diversity". Paleobiology. 30 (4): 522–542. doi:10.1666/0094-8373(2004)030<0522:OEAMDO>2.0.CO;2. ISSN 0094-8373. ^ Romano, Carlo; Koot, Martha B.; Kogan, Ilja; Brayard, Arnaud; Minikh, Alla V.; Brinkmann, Winand; Bucher, Hugo; Kriwet, Jürgen (27 November 2014). "Permian-Triassic Osteichthyes (bony fishes): diversity dynamics and body size evolution". Biological Reviews of the Cambridge Philosophical Society. 91 (1): 106–147. doi:10.1111/brv.12161. ISSN 1469-185X. PMID 25431138. ^ a b c d Tanner LH, Lucas SG, Chapman MG (2004). "Assessing the record and causes of Late Triassic extinctions" (PDF). Earth-Science Reviews. 65 (1–2): 103–139. Bibcode:2004ESRv...65..103T. doi:10.1016/S0012-8252(03)00082-5. Archived from the original (PDF) on October 25, 2007. Retrieved 2007-10-22. ^ Bardet, Nathalie (1994-07-01). "Extinction events among Mesozoic marine reptiles". Historical Biology. 7 (4): 313–324. doi:10.1080/10292389409380462. ISSN 0891-2963. ^ Thorne, Philippa M.; Ruta, Marcello; Benton, Michael J. (2011-05-17). "Resetting the evolution of marine reptiles at the Triassic-Jurassic boundary". Proceedings of the National Academy of Sciences. 108 (20): 8339–8344. doi:10.1073/pnas.1018959108. ISSN 0027-8424. PMC 3100925. PMID 21536898. ^ Colbert, Edwin H. (1958-09-15). "Tetrapod Extinctions at the End of the Triassic Period" (PDF). Proceedings of the National Academy of Sciences. 44 (9): 973–977. doi:10.1073/pnas.44.9.973. ISSN 0027-8424. PMID 16590299. ^ a b c d Olsen, P. E.; Shubin, N. H.; Anders, M. H. (1987-08-28). "New early Jurassic tetrapod assemblages constrain Triassic-Jurassic tetrapod extinction event" (PDF). Science. 237 (4818): 1025–1029. doi:10.1126/science.3616622. ISSN 0036-8075. PMID 3616622. ^ Konietzko-Meier, Dorota; Werner, Jennifer D.; Wintrich, Tanja; Martin Sander, P. (2018-10-31). "A large temnospondyl humerus from the Rhaetian (Late Triassic) of Bonenburg (Westphalia, Germany) and its implications for temnospondyl extinction". Journal of Iberian Geology. doi:10.1007/s41513-018-0092-0. ISSN 1886-7995. ^ a b Hodych, J. P.; Dunning, G. R. (1992-01-01). "Did the Manicouagan impact trigger end-of-Triassic mass extinction?". Geology. 20 (1): 51–54. doi:10.1130/0091-7613(1992)0202.3.CO;2 (inactive 2019-03-14). ISSN 0091-7613. ^ a b Racki, Grzegorz (2010). "The Alvarez impact theory of mass extinction; limits to its applicability and the "great expectations syndrome"" (PDF). Acta Palaeontologica Polonica. 57 (4): 681–702. doi:10.4202/app.2011.0058. ^ Onoue, Tetsuji; Sato, Honami; Yamashita, Daisuke; Ikehara, Minoru; Yasukawa, Kazutaka; Fujinaga, Koichiro; Kato, Yasuhiro; Matsuoka, Atsushi (8 July 2016). "Bolide impact triggered the Late Triassic extinction event in equatorial Panthalassa". Scientific Reports. 6: 29609. doi:10.1038/srep29609. ISSN 2045-2322. PMC 4937377. PMID 27387863. ^ Schmieder, M.; Buchner, E.; Schwarz, W. H.; Trieloff, M.; Lambert, P. (2010-10-05). "A Rhaetian 40Ar/39Ar age for the Rochechouart impact structure (France) and implications for the latest Triassic sedimentary record". Meteoritics & Planetary Science. 45 (8): 1225–1242. Bibcode:2010M&PS...45.1225S. doi:10.1111/j.1945-5100.2010.01070.x. ^ Smith, Roff (2011-11-16). "Dark days of the Triassic: Lost world". Nature. 479 (7373): 287–289. Bibcode:2011Natur.479..287S. doi:10.1038/479287a. PMID 22094671. Retrieved 2011-11-18. ^ Spray, John G.; Kelley, Simon P.; Rowley, David B. (12 March 1998). "Evidence for a late Triassic multiple impact event on Earth" (PDF). Nature. 392 (6672): 171–173. doi:10.1038/32397. ISSN 1476-4687. ^ Kent, Dennis V. (10 September 1998). "Impacts on Earth in the Late Triassic" (PDF). Nature. 395 (6698): 126. doi:10.1038/25874. 2 levels across the Triassic/Jurassic boundary". Nature. 411 (6838): 675–677. doi:10.1038/35079548. PMID 11395765. ^ Blackburn, Terrence J.; Olsen, Paul E.; Bowring, Samuel A.; McLean, Noah M.; Kent, Dennis V; Puffer, John; McHone, Greg; Rasbury, Troy; Et-Touhami7, Mohammed (2013). "Zircon U-Pb Geochronology Links the End-Triassic Extinction with the Central Atlantic Magmatic Province". Science. 340 (6135): 941–945. Bibcode:2013Sci...340..941B. CiteSeerX 10.1.1.1019.4042. doi:10.1126/science.1234204. PMID 23519213. ^ Schaller, Morgan F.; Wright, James D.; Kent, Dennis V. (2011-03-18). "Atmospheric Pco2 Perturbations Associated with the Central Atlantic Magmatic Province". Science. 331 (6023): 1404–1409. Bibcode:2011Sci...331.1404S. doi:10.1126/science.1199011. ISSN 0036-8075. PMID 21330490. ^ Fowell, S.J. ; Olsen, P.E. (May 1995). "Time calibration of Triassic/Jurassic microfloral turnover, eastern North America—Reply". Tectonophysics. 245 (1–2): 96–99. CiteSeerX 10.1.1.383.7663. doi:10.1016/0040-1951(94)00256-9. ISSN 0040-1951. Hodych, J. P.; G. R. Dunning (1992). "Did the Manicougan impact trigger end-of-Triassic mass extinction?". Geology. 20 (1): 51–54. Bibcode:1992Geo....20...51H. doi:10.1130/0091-7613(1992)020<0051:DTMITE>2.3.CO;2. McElwain, J. C.; D. J. Beerling; F. I. Woodward (27 August 1999). "Fossil Plants and Global Warming at the Triassic-Jurassic Boundary". Science. 285 (5432): 1386–1390. doi:10.1126/science.285.5432.1386. PMID 10464094. Whiteside, Jessica H.; Paul E. Olsen; Timothy Eglinton; Michael E. Brookfield; Raymond N. Sambrotto (March 22, 2010). "Compound-specific carbon isotopes from Earth's largest flood basalt eruptions directly linked to the end-Triassic mass extinction". PNAS. 107 (15): 6721–5. Bibcode:2010PNAS..107.6721W. doi:10.1073/pnas.1001706107. PMC 2872409. PMID 20308590. Deenen, M.H.L. ; M. Ruhl; N.R. Bonis; W. Krijgsman; W. Kuerscher; M. Reitsma; M.J. van Bergen (2010). "A new chronology for the end-Triassic mass extinction". Earth and Planetary Science Letters. 291 (1–4): 113–125. doi:10.1016/j.epsl.2010.01.003. Tetsuji Onoue; Honami Sato; Daisuke Yamashita; Minoru Ikehara; Kazutaka Yasukawa; Koichiro Fujinaga; Yasuhiro Kato; Atsushi Matsuoka (2016-07-08). "Bolide impact triggered the Late Triassic extinction event in equatorial Panthalassa". Scientific Reports. 6: 29609. Bibcode:2016NatSR...629609O. doi:10.1038/srep29609. PMC 4937377. PMID 27387863.